when added in small quantities. Too much can ruin the effect, so go sparingly. In that way a small pot can last ages. Match the color to your project. Use gold or silver for a rich effect. Try pewters and bronzes for something different. This product comes in many grades and each will help you to create a different look to any of your designs. 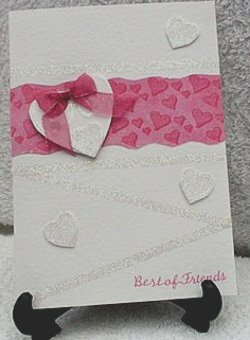 Glass and glues in many colors and super fine ones that are ideal for sparkling up text. 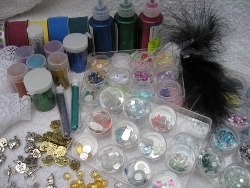 The row of bottles at the back of the picture are special sparkly glues. These are another useful addition for a subtle effect. Especially useful when working with images. They can be used to create the appearance of folds in a dress, or highlight a specific area. When you are working with the loose material always work on a piece of spare paper, that way the surplus can be tipped off the card, and caught on the paper, then just poured back in to the pot for next time. They come in lot of different colours, made by many different companies. The punched hearts are treated to the same trick. The sentiment is a pink peel off. A hot glue gun works too but mind your fingers as they get very hot.